Our unfinished Hardwood flooring is milled to very close tolerances and does not require heavy sanding after installation. Two grades are available: Character Grade retains the natural defects of the growing tree, allowing grain and color variation, knots, worm holes and surface checking. It creates a rustic, casual, lived in look. Clear Grade is warm and formal, free of character marks and more consistent in color. Our plank floors replicate the look of floors installed more than a century ago with lengths to 12' and widths to 7". These floors can be textured with marks left by sawmills as logs are cut into lumber. Many farmhouse floors still show these marks even after a century of traffic. Pies of the 3 styles Cross hatch, Circle and Band. 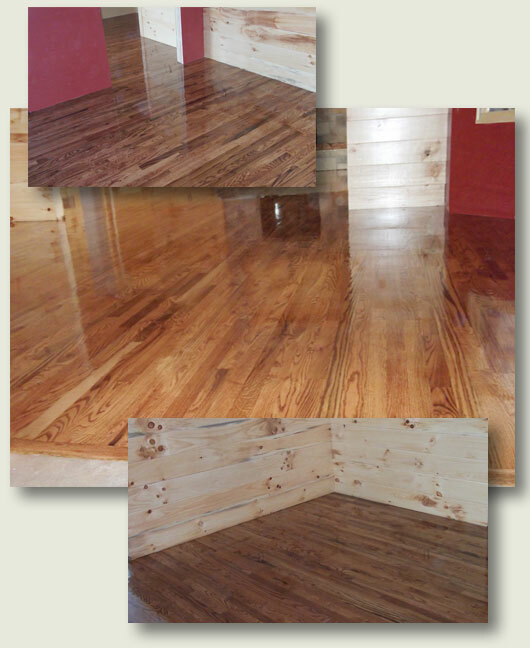 Our standard flooring is manufactured 3/4 thick by 2-1/4", 3", 4", and 5" wide. Lengths range from 12" to 7' with an average length of 42". 5/16" x 2" clear strip is also available to match top nail flooring in older urban homes.